We don’t think anyone would disagree when we say cars are more advanced than ever. In fact, many of the functions we perform ourselves are becoming automated by computers within our vehicles. Think lane-departure, park-assist, or collision detection systems. Soon enough, most cars on the road may be driving themselves entirely. So how have mechanics kept up with the changing times? The constant advancements in the automotive industry have changed the day-to-day job of mechanics immensely since the 1980’s. Back then, a mechanic was someone who understood the workings of mechanical and hydraulic systems inside and out. Cars operated with mechanical components and did not have many onboard electrical systems that the mechanic needed to worry about! Before onboard electrical systems, technicians were only required to have a strong understanding of how to troubleshoot and fix mechanical systems in the cars they serviced. At this time, it wasn’t uncommon for people to work on their cars if they had the understanding. 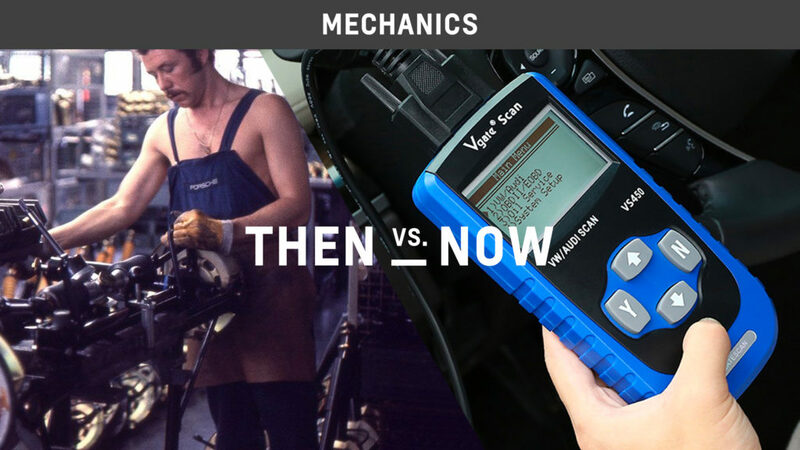 But as the saying goes: times changed, and the introduction of computerization, vehicles drastically changed the requirements needed to be a good automotive mechanic. Vehicles with self-diagnostic and reporting capability (OBD) were first introduced in the early 1980’s and were able to notify the driver if a problem had arisen. DTC’s (Diagnostic Trouble Codes) were introduced to assist the technician with troubleshooting problems. While these systems gave feedback to the technician, the amount of information gathered was minimal. Vehicles produced today still incorporate the ODB II system, but at a much more complicated level. Cars now have a sensor for just about every mechanical component and several have the ability to indicate the severity of the issue. For example, if the engine should develop a misfire, it causes the MIL (Malfunction Indicator Light) to illuminate. In the case of a severe engine misfire, the MIL will flash alerting the driver to pull off the road where safe and shut off the engine. In today’s market, mechanics that do not have a strong understanding of all of these sensors, systems, strategies and components have difficulty working on modern cars. Technicians need to constantly invest time in learning how new systems function and what is needed to service them. When an issue arises with your car, it’s tempting to try to save a little by fixing it yourself or asking someone you know. While this may have been a good idea years ago, and some things can be done yourself, modern cars need to be diagnosed and fixed properly to maintain performance and comply with emission standards. Proper diagnostics and repair can be difficult and time-consuming and usually requires very specific tools and software to complete. It is important to find a shop you can trust, though. At Master Mechanic, you can talk to the mechanic directly, and we’re always happy to explain every issue before a repair is performed. Contact us today to book an appointment!